Hey guys! 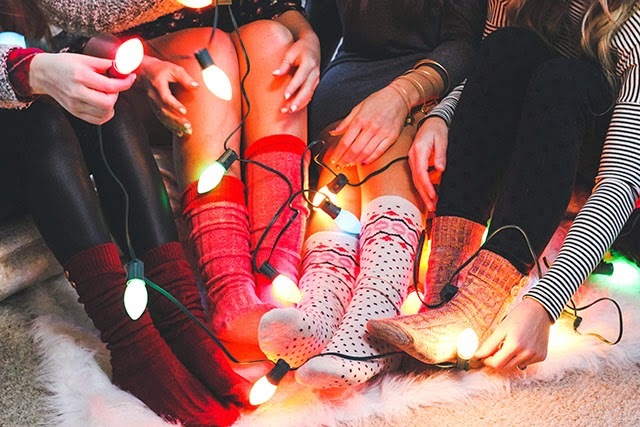 I'm so excited to kick off a holiday look book series with some of my best blogging friends! Paige, Tara, Brooke and I teamed up with the wonderful Rox B Photography to bring you some holiday inspiration. I feel so blessed to know so many amazing girls that inspire me on daily basis. Get ready for lots of looks that you can wear during different holiday occasions. This first look is meant to give you ideas for what to wear during the holidays while curled up by the fire, reading a good book and waiting for dinner to come out of the oven. Lounge-wear during the holidays is an absolute must because let's be honest, what are the holidays without sitting around the house laughing and being with loved ones? Make sure you check out all the cute blogs involved and stay tuned for the three other looks we have for you! What a fun photoshoot!! Thanks for sharing girl!! such a fun & adorable shoot. it looks so cozy with those lights! It was cozy town for sure! I loved every second and definitely went home and took a nap after.